In any case, when I was old enough to decide that my Mom couldn’t stop me from growing my hair, I vowed never to cut it. Through the years, I would break that vow and each and every time, I would regret it. I always felt that I looked too much like a boy and my roundish face wasn’t suited for short hair. So what changed? A few years ago I read somewhere about a program to donate hair so that wigs could be created for cancer patients. You see, when I was six, my Mom was diagnosed with cancer. She was given six months to live. One of the first things that entered her mind was that if she died, she hoped that my Dad would marry one of her unmarried sisters so that he would someone to take care of him. That’s the kind of person she has always been – thinking about others before herself. My Mom was also refused to let cancer beat her. 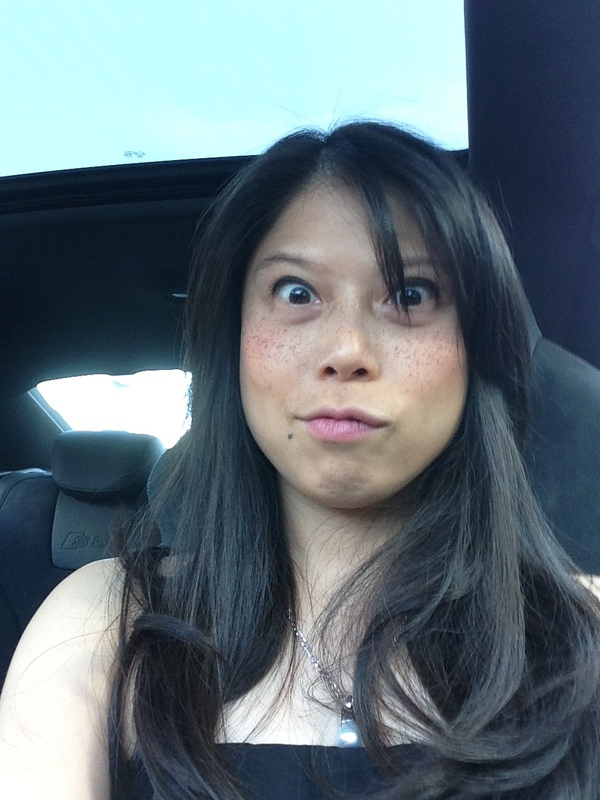 She was so tough that she would even drive herself to chemo sessions! One time I asked her, what was the hardest part of cancer. She said it wasn’t the chemo, nor was it that she had a mastectomy. She said it was losing all her hair. Many years later, my Mom is thankfully still alive and kicking… oops, make that, alive and dancing! I also remember my mother in law who unfortunately passed away from cancer a year ago. She was also another generous person who when I asked how she was doing she would always say to please take care of her son (my husband). She had battled with the disease for a few years and over time we noticed that less and less she felt like going out and socializing. I think part of it was because she had also lost her hair and was self conscious of this. For a girl, losing one’s hair can be a confronting experience. It can make you lose your self esteem. As much as I loved having long hair, I wanted more to be able to do one little act to tell everyone who may be suffering from cancer and losing their hair that there are people who care. I care. It’s also my small way of acknowledging and supporting people like my Mom and Mom in law who have had cancer. I’ll be the first to admit, there were times, in particular when I saw the hairdresser’s scissors, that I wanted to chicken out. But, I hope by my writing about this, there are others who are inspired to show they care and donate their hair. Pantene have a program called Beautiful Lengths that provide free real hair wigs to women who have lost their hair through cancer treatment. At a minimum hair must be 20 cm long and cannot be dyed, bleached or chemically treated. More information can be found on their website. So this is me today, and I’m simply loving my new look. This is one time I’ve had no regrets about having short hair. Short recipe for this post. My husband and I have been experimenting on a spicy scallop recipe on the back of a new recipe book I purchased a few weeks ago called Hashi. The original recipe requires you to make your own mayonnaise and serve the spicy scallops atop a bed of rice. I’ve adapted the recipe for a much more simple, yet delicious approach. 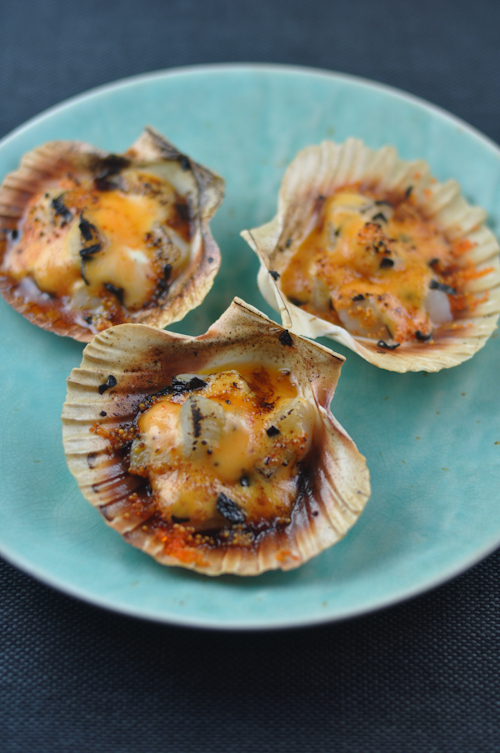 Spray the scallop shells with a little cooking oil. Cut the scallop meat into 1 cm sized pieces (usually quartering them will be enough) and lay them on top of the scallop shells. Mix the Japanese mayonnaise and chili sauce together and set aside. Top the scallops with a few nori pieces and some of the flying fish roe. Spread some of the Japanese mayo mixture over the scallops and either grill the scallops in the oven or blow torch the scallops until the mayonnaise turns golden brown. I think you look better with short hair! Trissa, thank you so much for donating your hair. I, too, had breast cancer but I was lucky in that it was detected early and the cancer had not spread from the one small tumour. Nevertheless, my oncologist advised that I undergo chemotherapy, just to make sure to zap any remaining cancer cells that might be lurking. You are so right! It was not the mastectomy that bothered me as much as the loss of my hair, so thank you again for thinking of us. 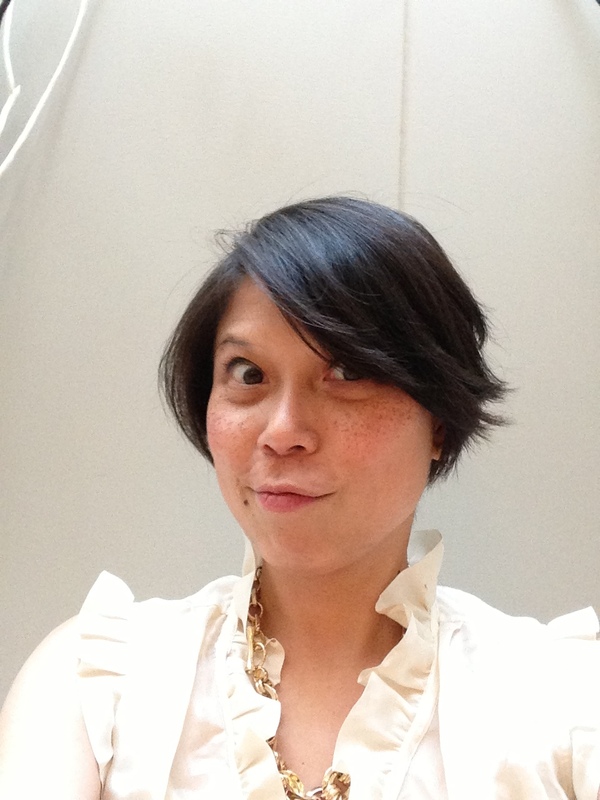 Loving the new do Trissa! You look gorgeous. Good on you for your donation. I’m definitely going to keep it in mind for when my hair grows out and isn’t dyed. Thanks for raising the awareness for a worthy cause! You look so gorgeous hun! Loving the new do. Good on you for your donation, I’m certainly keeping it in mind once my hair grows out a bit more and isn’t dyed. That is for a very good cause. Doesn’t it feel so much lighter as well. Ooh I love it 😀 looks so fab and chic! Looks super cute! And the scallops look amazing too =). I did something similar in terms of donating hair back in high school — great thing for you to contribute! oh nice haircut Trish, just in time for summer hey? 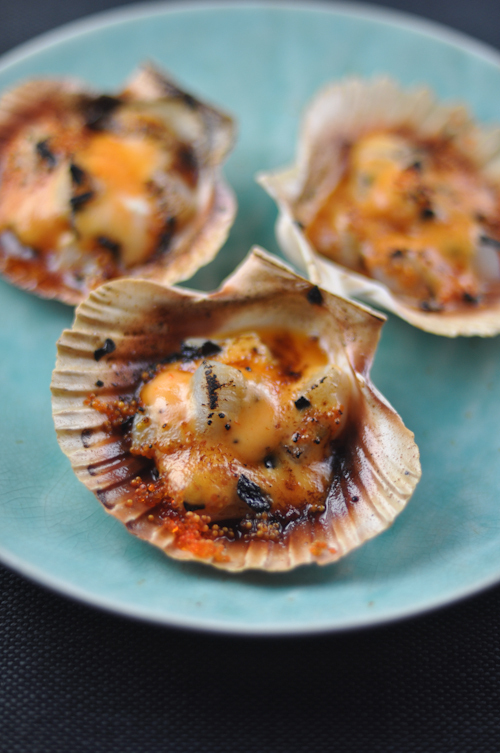 omg scallops yummmm… flicking through all my favourite food blog is killing me! i cant wait till my wisdom teeth heal so i can try out this recipe! Yum! Reminds me of dynamite in Japanese restaurant. Need to try it soon! Thanks. I think you look stunning. What you did will make someone so happy. Feeling beautiful while going through such a battle is what makes them stronger. You are an inspiration. The scallops love delish. I can’t wait to try them. Tremendous cause and motivation, you look great with your new hair cut. I will have make this scallops for the hubby.